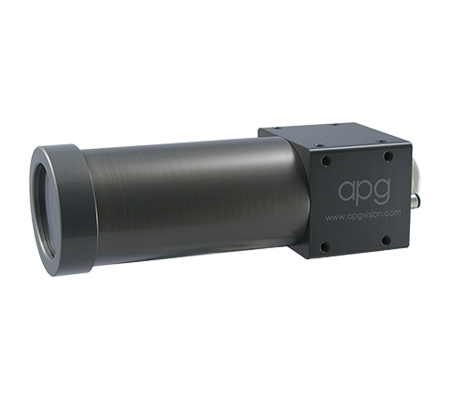 The 22C series enclosure was developed specifically for today’s 30mm x 30mm cross-section miniature inline cameras. It will also accommodate lenses up to 48mm in diameter. It is especially useful for robot applications, and is small & light enough to be mounted on the arm or end effector. The enclosure provides tool-less access to the camera & lens, and is available with either a standard PG16 drillable cord grip, or a bulkhead cable fitting for quick disconnect. Other options include glass or acrylic windows, air cooling, and an air curtain option that blows a film of air over the outside of the viewing window. This is effective in keeping dust, water and oil mist off the window. The enclosure comes standard with a clear anodized finish, and can be supplied in a variety of colours and finishes. Enclosure is constructed of 6061 aluminum (body, barrel & faceplate) and 304 stainless steel (rear bulkhead). Window is glass or acrylic. All supplied fasteners are 18-8 stainless steel. Fasteners to mount your camera are included. NOTE: The construction of this enclosure does not meet standards for food applications. Weight: 19.7 oz with standard barrel & Hirose bulkhead connector, 19.2 oz with PG16 cord grip. Optional Pan and Tilt mount also available.